The 6th page of lame nonsense no one wants! 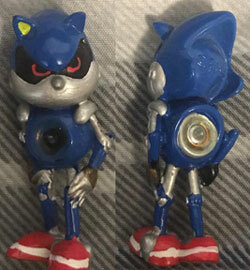 Mutant Gear now irritates everyone with a 6th page of supid looking dolls and other horrible items made in Sonic's name. Bad design, poor products, and terrible likenesses abound. Help stamp out this bad junk by refusing to buy it! Remember: when mutant makers don't get money, they won't make more mutants. However, when you don't have it, you can come here to make fun of it! 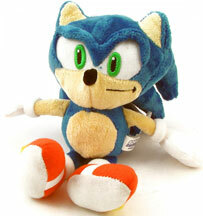 So let's get into it with this blah Sonic figure first! He's supposed to be crossing his arms (like the Stock art) but this pose is more him doing the "X" symbol with his arms. And that...is the least of his worries. The poor paint job on the eyes is just atrocious with 1 big & 1 small black dot, the badly painted/pointy center there only adds to the awful look, along with the 'spill' where the white goes out of the eye area very clearly on both tops. Next, look at his wrong spikes in 3 thin strips. Remember: this is AFTER Sonic 2 where the game literally shows you this is NOT how his spikes go. What is their excuse here? This crummy figure has once more the super ugly unevenly-sized eyes AND they painted the blue part all the way down to the lower face, separating the eyes and just piling on the problems. 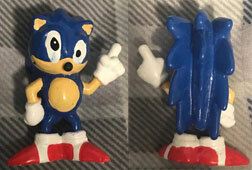 This one is finger-waving Sonic, so the pose is a bit better but the spikes actually seem worse here, with them going all the way down to his socks. But not by much. At least they used metallic-tone silver paint on him. Sorta. Notice how 1 ear interior has entirely skipped getting painted. The lines on the shoes are super sloppy, and he has a giant lower-face for some reason. The hands (predictably) are fused/posed with the upper leg to avoid having to fiddle with them in molding. Yep...that's still the 'sega' copyright on the back of the head there...though they'd likely not want to be associated with something of this bad quality. Of course: This one is a confusing (or not?) pick, because there was a period where merchandise/whatever was obsessed with Robotnick being a stupid fat guy...for some reason...because that's the clear route to go when someone is described as "super genius who nearly conquers the world"?? 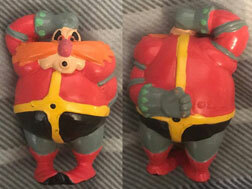 A mild mutant figure is here with the Tails from the set. This one, like poor Robotnick above, isn't too terrible. There's some bad paint work around the eye edge, but it's not horrible. The hand is spilling onto his tails...but it doesn't quite ruin the look. 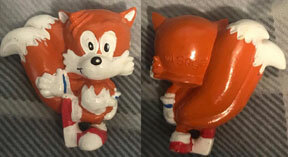 No, the photo color isn't mistaken, this is "Brown Tails" a color that was always wrong, but several merchandisers/comics/even the SatAM show...were convinced was right because "what fox is orange?" while never asking "what hedgehog is blue?" 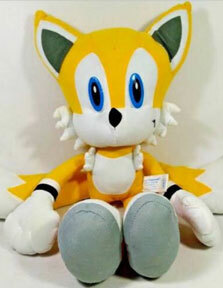 aaaand then only changing Tails' color to 'normal'. These are likely to be handpainted at some factory somewhere. 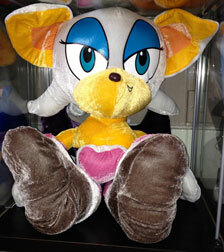 Did you know Toy Network made a Rouge the Bat plush? San-Ei has made some ok dolls before. Win this as a prize? Hopefully not! This unfortunate doll is by "Hunter Leisure" of Australia. 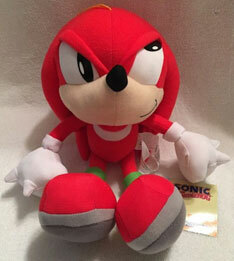 It's exclusive to there, and was produced as a carnival type prize plush around 2013 or so. They came in 3 sizes (likely all bad!) small, medium & large. You may have heard of "Nanco" before but in the form of "Nanco-Nancy". 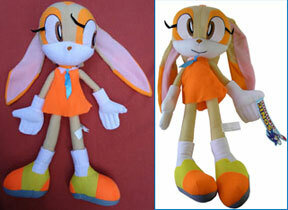 They're a carnival prize type maker with plastic and plush stuff for arcades and prizes. Annnnd they're clearly not into quality. 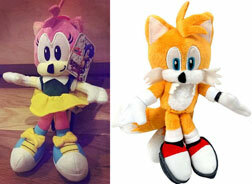 All 4 of these rotten plushes are polluting Australia. Mutants usually crop up in the USA (but originate in China) so seeing an Australia item is badly interesting. No matter how rotten they look, they are official & Nanco's fault. The first Shadow here suffers not only from uneven eyes, but an unevenly flopped/poorly made upper eye flap which makes him look even worse. 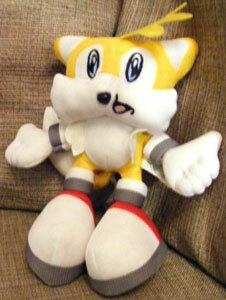 He also has pancake hands, withered ears & kind of squashed spikes. Shadow #2 is smaller, and somehow slightly better. The feet are way too small, and the shoes are innacurate, however the face, while a bit mushy & with too-wide a red stripe at least has somewhat better ears. 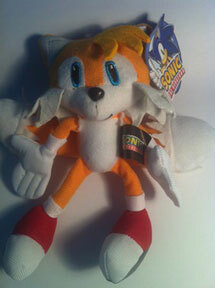 Tails is really suffering here...look at that snooty face, wrongly shaped eye color/center, super thin rubbish hands, misproportioned shoes/colors, missing glove/shoe belts & stupid looking smile. This one is big and just 'ugh'. 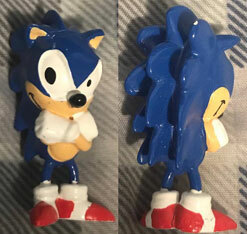 Sonic is another small (note the proportion of the paper tag) but you'd think he was a bootleg with his terrible shoes (did they just have an idea of his shoe? no picture of what it really was?) cheapest hands possible & sort of off face. 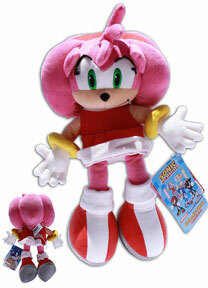 Because Japan & Sega are in Japan...mutant stuff is seldom seen there. She seems really quality with nicely sculpted hands with good fingers, nice shoe/boots, gold bracelets & good fabric. There's also tags all over, 2 paper tags and 1 cloth tag on her back. But then....her head is just SO FAT! And look at her body...it's like a big square or a flattened rectangle...thing. Her spikes have pressed her ears down/forward, but her bangs are nicely stuffed. The eyes are embroidered...and her over-all head shape/face is good but those big messed up spikes and wierd body just throw the whole thing off. Kids might scream for icecream...but here's Eye...Cream! Fun 4 All? More like Fun 4 None! This one goes right into the mutant bin because it is missing the bangs. They're so low quality that someone just probably forgot them and let him out anyway. There's no damage/threads or anything to indicate they were ever there. The the odd dark ear interiors (they always have had this, it never looked very good), uneven quality of the eyes & very tall head...he just looks extra strange. The glove cuffs aren't very well done either, sure they have a band but they're not really a cuff. 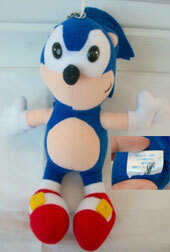 This is a large size doll (note size of cloth tag there on the side where you can clearly read "Toy Network") so it was probably not cheap to buy although it was clearly a cheap effort.